Does Success in September Carry Into October? The Red Sox’ bandwagon has slowly begun to empty as the team struggles through a nightmarish stretch during which it has lost six games to Tampa in the standings. Fortunately, those abandoning the Boston ship have found passage on the Tigers’ pennant drive. Over the last three weeks, Detroit has won 16 of 20 games and built an insurmountable lead in the Central. If the season ended today, the surging Tigers would meet the slumping Red Sox in the ALDS. Judging by the trending conventional wisdom, this clash of teams going in opposite directions would have Red Sox Nation tuning into the Patriots a lot earlier than expected, but should we rely on September records when handicapping post season series in October? 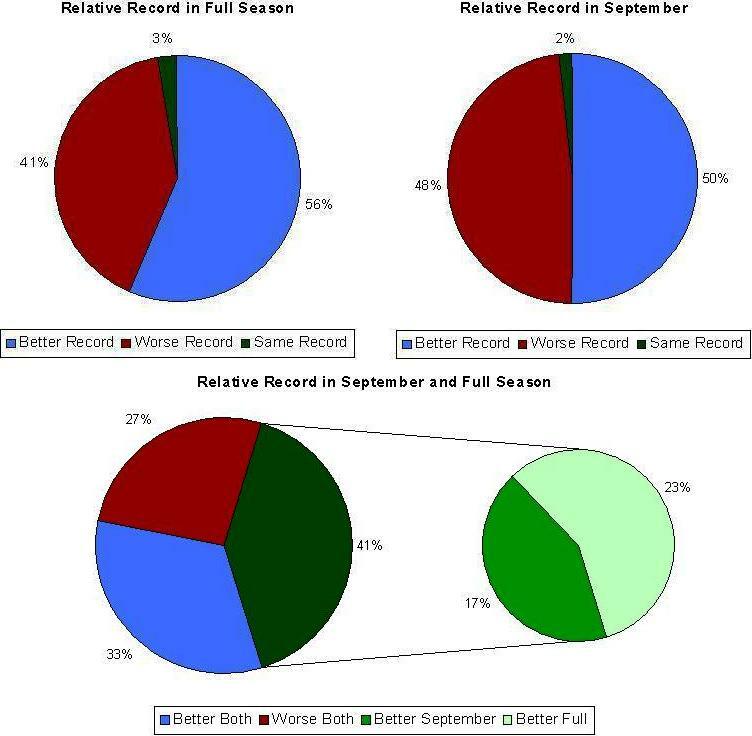 In a 2009 Baseball Prospectus post, Jay Jaffe looked at winning percentages over defined periods in September and found no meaningful correlation to various measures of post season success. However, the study did not distinguish between the relative records of opponents, nor any relationship between overall winning percentage and the rates compiled over the defined periods. In addition, Jaffe’s study was limited to post season series played since 1995. So, as a supplement to his work, the following incorporates the two aforemetioned variables into a breakdown of every first round post season series since 1969. Note: Includes all first round post season series since 1969. Ranges refer to the winning percentage disparity between teams. A negative range indicates that a team with a lower record won the series. There have been 116 first round post season series since 1969 (LCS from 1969 to 1993 and LDS in 1981 as well as from 1995 to 2010). Of that total, 65 series (or 56%) were won by teams with the better regular season record, while in 58 (or 50%), the victor was the team with a better winning percentage in the final month. According to this data, the hottest team’s chances of winning in October were no better than a coin flip. However, if we assume those teams tend to be inferior (i.e., they have to win just to make the playoffs, while better teams have the luxury of resting their players down the stretch), then perhaps a 50/50 chance actually represents an enhancement? 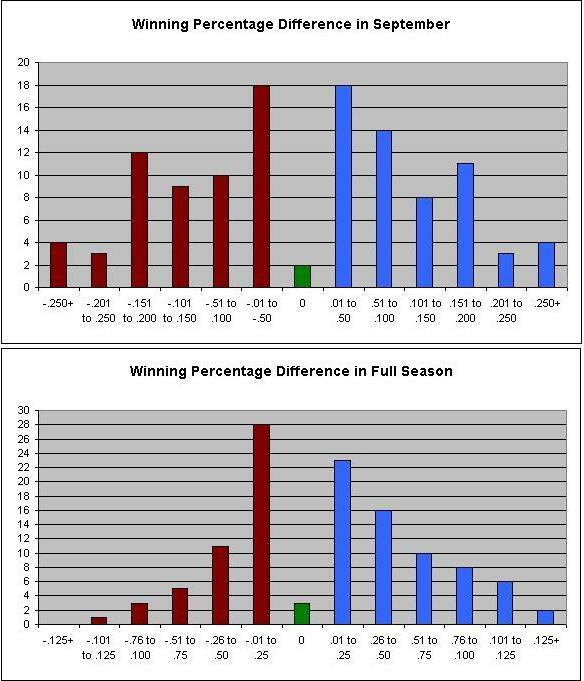 One way to test this theory is by combining our comparison of winning percentages for the season and final month. In 69 first round post season series, the team with the better regular season record also entered October as the hotter side. However, only 38 teams of those teams actually won the series, a percentage that is almost equal to the rate associated with having a better regular season record. This implies that being hot doesn’t provide a marginal advantage. What’s more, of the 47 occasions when the better regular season and September records were split, the team with the 162-game advantage won the series 27 times (57%). Because a significant number of post season series take place between teams with relatively comparable records, the data can become skewed. In order to overcome that distortion, the sample of post season series was refined based on degrees of disparity in winning percentage over both the full season and final month. As evidenced by the charts above, a greater disparity in regular season record increasingly correlates to a first round victory by the better team. However, being hot once again seems to have no impact. Not only was the cumulative split between “hot” winners and losers close to 50/50, but the even distribution persists at the most extreme parameters. Based on this evidence, it seems as if being hot really does have little-to-no impact on success in October. Before dismissing the benefit of entering October on a hot streak, one more data segment was considered: those series in which there was a less than 25 point difference between the opponents’ full season winning percentages. Among this subset of 54 series, only 24 were won by the “hotter” team. What’s more, when increasing the granularity in this segment to teams with a September winning percentage disparity of at least 100 points (i.e., series with a small full season disparity, but significant September divergence), the ratio only returns back to 50%. In other orders, being hot doesn’t even make a difference among teams with very similar full season records. *Based on greatest disparity between opponents’ full season records. Finally, if you look at the top-five upsets based on disparity in regular season records, only two involved an underdog with a significantly better winning percentage in the final month. Even more confounding, in the 10 most extreme instances in which the team with the lesser September record won the first round series, all 10 also had the weaker regular season record. For example, when the Athletics met the Yankees in the 2000 ALDS, not only did Oakland have a better regular season record (.565 to .540), but the team also compiled the largest September winning percentage differential (.759 to .419) since the advent of divisional play. Despite these two advantages, which extended to winning the first game of the series, the Yankees were the team that advanced to the ALCS. If there is an advantage to entering the post season on a roll, it isn’t evident in the series outcomes. Contrary to popular misconception, baseball isn’t a “what have you done for me lately” sport, and momentum only exists if defined by the entire 162-game schedule. So, if the Red Sox and Tigers do meet in October, don’t be fooled by September when making your prediction. A coin flip would probably serve you just as well.